What Are The Health Benefits Of Chives? Chives, scientifically known as Allium schoenoprasum L., are a spice plant with origins in Central Europe. Chives, scientifically known as Allium schoenoprasum L., are a spice plant with origins in Central Europe. It belongs to the allium vegetable family, which also includes garlic, onions, shallots, and leeks. Humans have relied profoundly on medicinal plants for the treatment of several diseases, and the nutrition sector has exposed their therapeutic benefits. Prospective health benefits of allium vegetables, such as the chive, have been used since ancient times to cure diverse ailments, but extensive research is needed to further accredit some of the claimed benefits. Emerging research has identified a correlation between chives and a reduction in the incidence of certain cancers, lowering cholesterol, as well as antioxidant and antibacterial activity. Research at the University of Novi Sad in Yugoslavia, published in 2004, investigated all plant organs of the chive to determine its antioxidant properties. All organs of the Allium schoenoprasum, including the bulb, leaf, and stalk, were found to exhibit antioxidant activity in studies completed on the plant. The highest amount of antioxidants were found within the leaves. One of the most imperative constituents of the chive plant is allicin, as it is known to contribute to its antibacterial and anti-fungal properties. Allicin, however, is not a natural active portion of the plant. It is naturally produced as a result of digestive enzymes in our bodies. In as little as 6 seconds, the compound alliin, which is naturally present in the plant, is converted to allicin by the enzyme alliinase. Research at the Ubon Ratchathani University in 2008 in Thailand assessed chive oil’s antimicrobial activity when exposed to various bacterial pathogens. The chive oil inhibited all pathogenic bacteria used in the study with varying degrees of inhibition. It was shown that chive oil was even able to inhibit E.coli, a well-known bacterial pathogen. These results indicate that the use of chive oil to prevent and cure food-related illnesses, as well as aid in digestive maintenance, are possible alternatives to current treatments. Chives contain an organic compound (phytochemical) that has been shown to have significant cardiovascular health benefits. Chives, along with garlic, onions, shallots, and leeks, contain allylic sulfides. These compounds have been proven to decrease both total and LDL (bad) cholesterol levels. 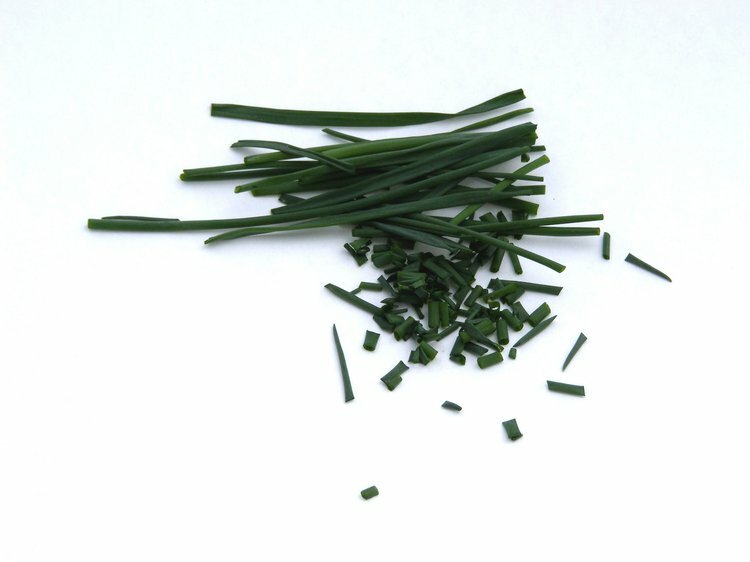 Enhanced blood pressure levels have also been seen with consistent consumption of chives. This translation of alliin to allicin was shown to result in anti-cancer properties, specifically anti-proliferative and pro-apoptosis characteristics. A 2010 Chinese study operated at Lanzhou University studied garlic, a close relative to chive plants and fellow allium vegetable, which also contains the fundamental compound allicin. The study was established to identify if previous research on the inhibition of tumor cell growth was due to either the compound alliin or allicin. Interpretations of the results showed that allicin was responsible for inhibiting the production of tumor cells and inducing cell death, known as apoptosis. This research suggests that anti-cancer effects are only achieved after human digestion and effects cannot be seen in other forms of administration. Extensive research has been completed to assess the types of cancer that chives and other allium vegetables that can lead to tumor cell suppression and anti-cancer effects. Results of a study performed in 1999 at the Cancer Institute of Jiangsu Province in China demonstrated that allium vegetables might have an imperative protective effect against not just stomach cancer, but also esophageal cancer. Try incorporating chives into meals as a tasty garnish. Chives pair well with soups and chowders, salads, salad dressings, potatoes, fish, meat, poultry, cheese, and eggs. Chives are a great option when looking for a milder flavor than onions or garlic. Due to the plant’s antibacterial, antioxidant, and anti-cancer properties, as well as cardiovascular benefits, there is no reason to not use chives as a frequent seasoning when preparing meals. Consult a nutritional expert if you are interested in supplements containing chives to help determine if they would be right for your body. If only obtaining these health benefits from other foods was as easy as seasoning with a flavorful vegetable, health maintenance would be a simpler task. Stajner D, Canadanovic-Brunet J, Pavlovic A. Allium schoenoprasum L., as a natural antioxidant. Phytother Res. 2004;18(7):522-4. Indian Medicinal Plants: An Illustrated Dictionary. New York: Springer; 2007. Allium Schoenoprasum; p35. Wang Z, Liu Z, Cao Z, Li L. Allicin induces apoptosis in EL-4 cells in vitro by activation of expression of caspase-3 and -12 and up-regulation of the ratio of Bax/Bcl-2. Natural Product Research: Formerly Natural Product Letters. 2012;26(11):1033-1037. Vina SZ, Cerimele EL. Quality Changes in Fresh Chives (Allium Schoenoprasum L.) During Refrigerated Storage. Journal of Food Quality. 2009;32:747-759. Gao CM, Takezaki T, Ding JH, Li MS, Tajima K. Protective effect of allium vegetables against both esophageal and stomach cancer: a simultaneous case-referent study of a high-epidemic area in Jiangsu Province, China. Jpn J Cancer Res. 2009;90(6):614-21. Rattanachaikunsopon P, Phumkhachorn P. Diallyl Sulfide Content and Antimicrobial Activity against Food-Borne Pathogenic Bacteria of Chives (Allium schoenoprasum). Biosci. Biotechnol. Biochem. 2008:72(11):2987-2991. Egert, M., & Tevini, M. (2002). Influence of drought on some physiological parameters symptomatic for oxidative stress in leaves of chives (Allium schoenoprasum). Environmental and Experimental Botany, 48(1), 43-49. Rattanachaikunsopon, P., & Phumkhachorn, P. (2008). Diallyl sulfide content and antimicrobial activity against food-borne pathogenic bacteria of chives (Allium schoenoprasum). Bioscience, biotechnology, and biochemistry, 72(11), 2987-2991. Sang, S., Zou, M., Xia, Z., Lao, A., Chen, Z., & Ho, C. T. (2001). New spirostanol saponins from Chinese chives (Allium tuberosum). Journal of agricultural and food chemistry, 49(10), 4780-4783. Moon, G. S., & Lee, M. J. (2003). The long term effect of buchu (Chinese chives) diet on ROS formation in the liver and skin tissue of ICR mice. Journal of the Korean Society of Food Science and Nutrition.